Woodridge Academy students have the words virtue and valor stitched onto their school sweaters. Those attributes are put to the test as, half-blind and covered in blistering sores from the effects of contact with the fuzzy mud, our three main characters battle their way through the November woods. Suffice it to say the fuzzy in Fuzzy Mud, is not a warm fuzzy. But she also resents being called a goody-goody. Especially in front of the seventh-grade boys. So when Marshall, afraid of being beaten up by bully Chad, invites Tanaya to follow him into the woods under the ruse that it’s a short-cut home, virtue vanishes, and into the woods she goes. Tanaya’s teacher once told her “courage just meant pretending to be brave.” She puts up a good front until things start to go terribly, terribly wrong. The children make it out alive but not unscathed. Soon Tanaya realizes that she must venture into the woods again. This trip requires both valor and virtue. Tanaya is on a rescue mission: Chad is still in there. So is the fuzzy mud. 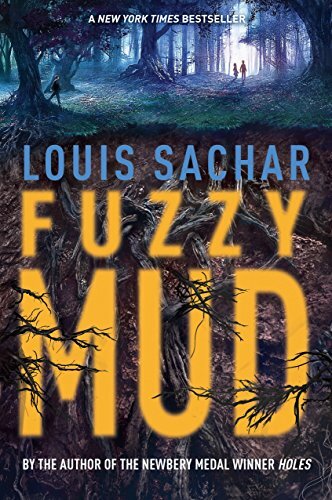 By inserting clever and amusing excerpts from the United States Senate Committee on Energy’s hearings regarding the activities at SunRay Farm, Sacher mediates the children’s truly frightening forays in the woods, where the caustic mud dissolves anything that comes into contact with it. At SunRay scientists created a never-before-seen form of life designed to solve our energy crisis. But it also appears to have caused another, more immediate, crisis. Although they provide welcome humor, these chapters are as sobering as the catastrophe quickly enveloping the three children, the residents of Heath Cliff, and the planet. We’re facing serious problems in the world today, Sacher seems to be saying, and finding and implementing solutions will require both virtue and valor. We must do the right thing, no matter how difficult and frightening. Sacher has set a children’s adventure story in a dystopian landscape. He keeps readers off balance but never lets us fall, just as he keeps the children from falling too deeply into trouble. Much of the tension in this book derives from the reader knowing more than the characters: we see the time bomb ticking in the forest and know the destruction it is capable of. The population is doubling at fairly predictable intervals, he notes in his epilogue: one billion in the 1800s, two billion by the 1950s, four billion by the 1990s, seven billion in 2011. This will be the world’s population the next time it doubles. Readers have learned that the purportedly harmless ergonym, building block of the planet-saving Biolene, reproduces at a prodigious rate. We know that it caused the maladies suffered by the children. Happily for the residents of Heath Cliff and the planet, ergonyms are susceptible to freezing temperatures, according to its inventor, a decidedly hyperactive “Fitzy.” When the snow flies, he assures the members of the energy committee, the ergonyms will die and a worldwide catastrophe avoided. Meanwhile, we have source of clean, affordable energy. We must wait until the snow melts to find out if he’s right.